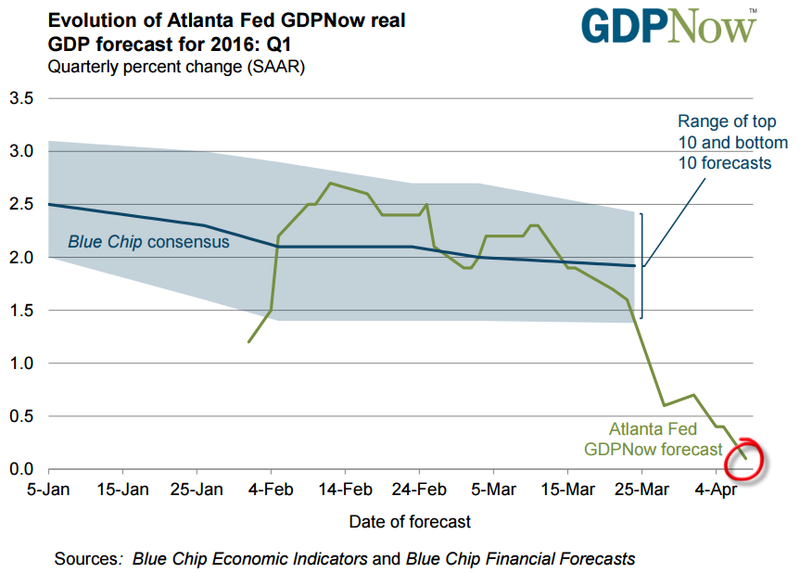 Earlier this year, Atlanta's GDPNow model was forecasting between 2-2.5% growth for the US economy in the first quarter. Since mid-March, however, the trend in economic data has deteriorated, bringing the current forecast all the way down to 0.1%. "The GDPNow model forecast for real GDP growth (seasonally adjusted annual rate) in the first quarter of 2016 is 0.1 percent on April 8, down from 0.4 percent on April 5. After this morning's wholesale trade report from the U.S. Bureau of the Census, the forecast for the contribution of inventory investment to first-quarter real GDP growth fell from –0.4 percentage points to –0.7 percentage points." 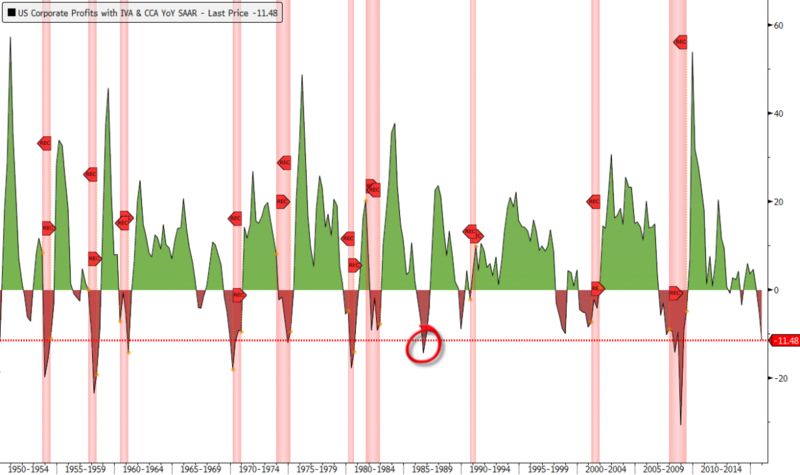 Though we are not expecting the US to be entering a recession currently, it is clear that the risk of one has increased meaningfully since last year. 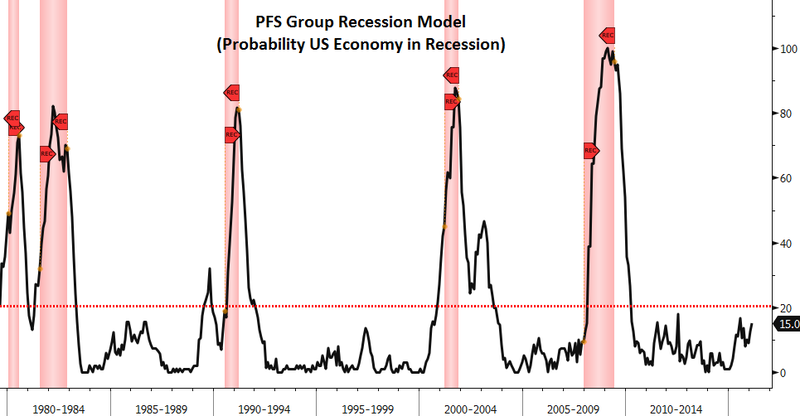 In the beginning of 2015, our recession model was showing a very low (1-2%) risk of recession. 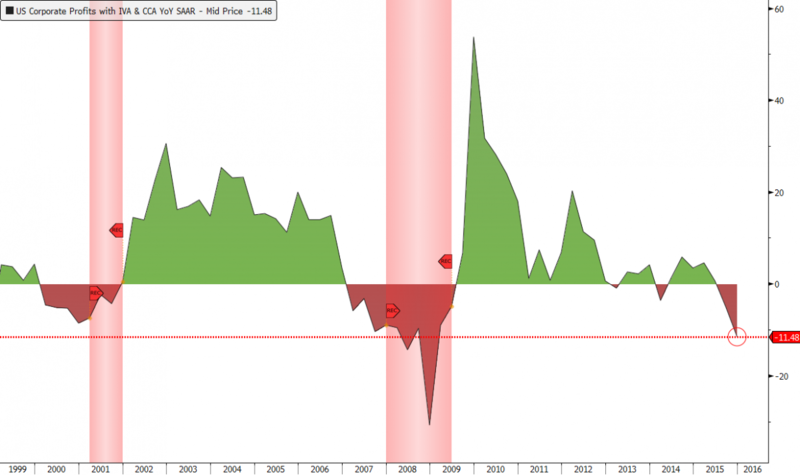 With deteriorating economic conditions, it is now reading a 15% probability, which is not far below the 20% critical threshold. Once we get above that point, economic weakness tends to accelerate, as seen in the chart below. Corporate profits are also giving a very clear warning signal on the US economy and stock market as well. On a year-over-year basis, the current decline is now steeper than the readings we saw entering the 2001 and 2008 recessions. If we look at the data going back to 1950, there was only one instance in 1986 (circled in red) where profits have declined this far year-over-year without the US economy entering a recession. Given the above and many of the other important leading indicators we've been highlighting recently, it is clear to us that there are significant risks facing the US economy and stock market at present. Though the stock market can diverge from economic fundamentals and credit market conditions over the short- to medium-term, downside risks vs. upside returns suggest a defensive posture toward equities in our view.